Studio Jules Art - Blog: Busy end of October! I know, I know, Halloween hasn't even past and I've started on Christmas already, but I have too! I've been working on 6 Christmas Stockings for my 3 new grand babies. I love decorating for Christmas and one item that is all over the house is stockings! The Red, White and Blue stockings run down the banister. They each have white hankies in the denim pockets with our individual names on them. The panel stockings (from Art to Heart a few years ago) are on our "Family Trees" in the foyer. I start decorating for Christmas the day after Thanksgiving. It takes a couple of days, so when we are done I'll show you the whole shebang. Some people in my family think I go overboard with my Christmas decorations, but I don't do near as much as some people I know. Plus I just love to decorate for Christmas and light up the house with joy, friendship and love ~ showing our love for the season and the Christ baby that made it all possible. Isn't that what it's about anyway? So, I'm back in the studio today to finish up the stockings and then continue testing ideas for a quilt I started before I left for Houston. 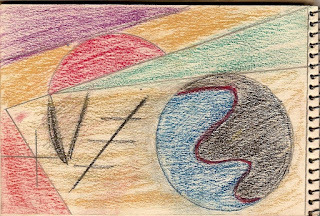 This is not an original design, I took it out of a sketch book that I found when we cleaned out the house of Jeff's aunt earlier this year. So above is the sketch and below is my interpretation of the sketch. Quilt name? "Genesis 1" I have fused hand painted silk (thank you Frieda Anderson!) 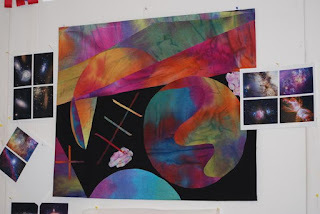 and the background will have celestial images made with fabric paints and paint sticks. You really hit the ground running upon your return from Houston!! Looks great. Now filling the stockings will be great fun!